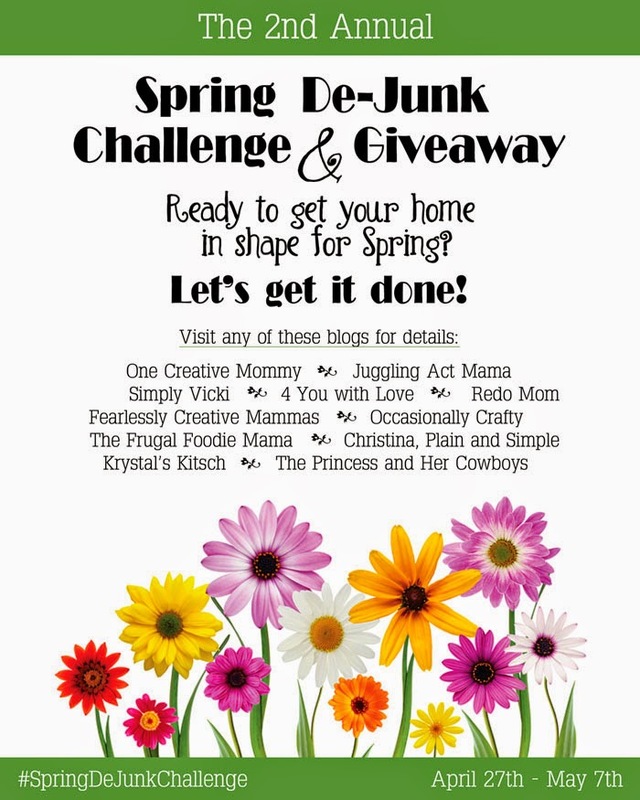 Some of you all may remember when I participated in the Spring De-Junk Challenge with Heidi of One Creative Mommy last year. There had been several areas of my home then that I just didn't have the motivation to tackle, but the challenge gave me the little kick in the booty that I needed to finally get in there and get things done. :) Well, guess what? Most of those once tidied areas are sadly back to the state that they were in pre-challenge last year... and in some cases, they look even worse. One of the kitchen drawers and my coffee mugs are all that is still tidy and organized from all my hard work last year. Boo. The problem for me seems to be stuff. Stuff that we keep accumulating either by choice or because they are given to us. Stuff that keeps piling up. Stuff that we are not getting rid of even though we haven't touched it in a year or more. Stuff that we keep moving and shuffling around in an attempt to store or organize them more neatly. And the last that I checked, our house hasn't been growing to accommodate all of this new stuff and old stuff. Can anyone else relate here?? Well, I have a new weapon in my de-junking arsenal this year, and I cannot wait to share that all with you next week. ;) Stay tuned. But in the meantime, check out all the 2015 Spring De-Junk Challenge and Giveaway info below! Will you join us next week in de-cluttering, de-junking, and organizing our homes and lives? We're announcing the challenge a week early so that you have time to mark your calendar to be ready to join us on Day 1. When you've finished dejunking or organizing that spot, post another photo of your newly cleaned space. Include the hashtag #SpringDeJunkChallenge with both photos so that we can follow your progress and to inspire others to join the fun. So, are you up for the challenge? Follow your hosts on Instagram (links are in the Rafflecopter for the giveaway) to see how we're all completing the challenge and to get some ideas. 11 bloggers have accepted the challenge. To add to the fun, all 11 of us will share a special post about getting our home in shape for Spring on Day 1 of the challenge. Don't forget to check back on Monday to get lots of inspiration for your own home. If you join the challenge, feel free to leave me your Instagram handle in the comments so that I can follow your De-Junking Journey. Be sure to visit the bloggers sponsoring the series and check out the great ideas on their blogs. We all love new visitors, and we'd love to hear from you! Thanks so much for stopping by today, and good luck with the challenge! Follow Carrie (Frugal Foodie Mama)'s board Getting My Organization On Pinterest Style on Pinterest.